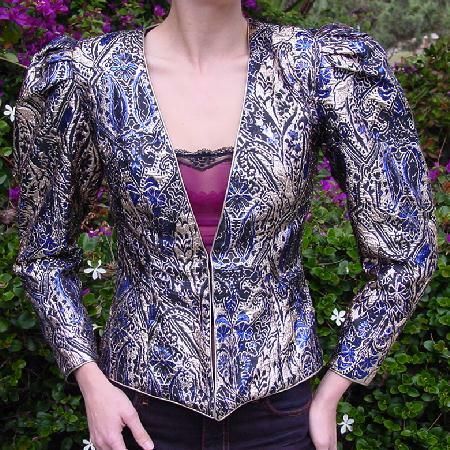 This vintage jacket is 40% metallic, 32% rayon, and 28% polyester, and was made in the USA. It has that '80s Dynasty styling and a really nice lining. It has a 3 eyehook interior closure. There is a black background with a floral design in gold and deep blue, and gold piping around the neck, front, bottom, and sleeve ends. 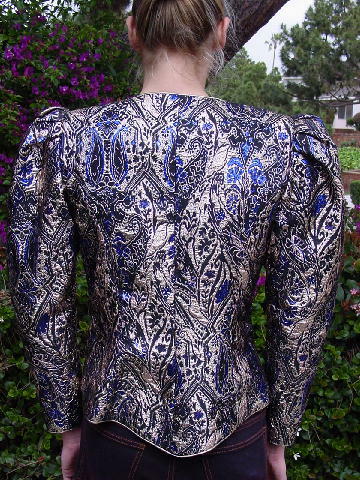 It has shoulder pads and large pleats across the top of the shoulder-sleeve seams. It has a deep 14" plunging V neckline. The bottom front dips downward and is longer than the sides and back. A model bought it at a vintage boutique in Los Angeles and wore it with a brocade Prada skirt and heels (no bra or blouse) to several Academy Award parties. shoulder pad to end of sleeve 23"
shoulder to bottom side hem 20 1/2"
shoulder to bottom front hem 22 1/2"
sleeve end opening side to side 3"